Sure, the expansion's not quite out yet, but that doesn't mean you can't start planning for it as a roleplayer if you want to. The pandaren race features some really amazing, beautifully animated characters with an intriguing story ripe for roleplay purposes. While some roleplayers may already be happily roaming around the beta servers, others have only bits of information to work with. The process of coming up with a roleplaying character can take a little time, so if you're wanting to create a pandaren when the expansion is released, why not start pondering possibilities now? Though pandaren can be played by both Alliance and Horde, they cannot speak to each other once they've made that decision -- a decision steeped in the storyline of the Wandering Isle. However, this does mean that you can play a pandaren character no matter which side of the faction fence you happen to be on. And with the kind of history and story the pandaren have behind them, it'd be well worth looking into if you're looking for a different kind of character to roleplay with. This is a primer of pandaren lore, and as such, it'll contain a little spoiler content. However, because of the unique nature of playable pandaren characters, we won't be divulging any major story events that take place in Pandaria. This information will mainly be starting zone info. If you're looking to avoid all Mists spoilers, however, you may want to pass on what's after the break. The pandaren story is a little confusing, mostly because there are two different types of pandaren -- those on Pandaria proper, and those on the Wandering Isle. If you're going to roleplay a pandaren, you'll be roleplaying one of the pandaren from the Wandering Isle. Why not a pandaren from Pandaria proper? Because the lore doesn't support it. The pandaren who are native to Pandaria have been hidden behind mists for thousands of years. They've got no real knowledge of what's going on out there in Azeroth and no real motivation for wanting to explore beyond Pandaria itself. The pandaren of the Wandering Isle have also been on their island for thousands of years, but there's a key difference here -- these pandaren are on the Wandering Isle because they want to explore and see the rest of the world. They have that zest for exploration. The Wandering Isle began thousands of years ago when one pandaren, Liu Lang, had such a zest for exploration that he decided to leave Pandaria, travel beyond the mists, and see what else was out there. To do this, he hopped on the back of a giant sea turtle named Shen-zin Su. As Shen-zin Su grew, more intrepid pandaren decided to join Liu Lang, until eventually a colony of pandaren was formed on the back of the giant turtle. This colony has been wandering the world for thousands of years, and the descendants of the original colonists are the pandaren we get to play in-game. Chen Stormstout is a native of the Wandering Isle. At some point. he hopped off and wandered around Kalimdor, which is when he met up with Rexxar during Warcraft III. 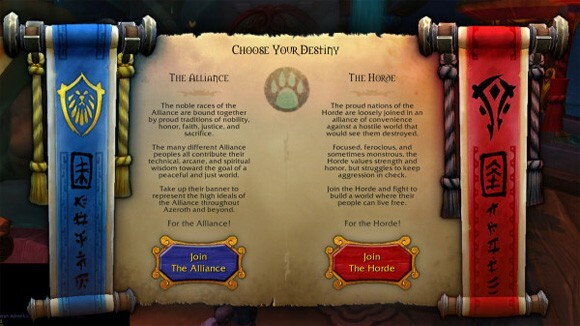 As a pandaren of the Wandering Isle, you get to play through the opening storyline that culminates at the end with a choice, Alliance or Horde. The choice is also tied into the two primary philosophies of the Wandering Isle, the way of the Huojin or of the Tushui. Each philosophical path has its own methods for approaching the world, and while neither is wrong, each path lends itself more strongly to one side over the other. Huojin The Huojin believe that inaction is the greatest injustice in the world and that there is no shame or dishonor in defending home, friends or family regardless of cost. The Huojin philosophy is very much one of act first, ask questions later. Huojin followers are precise and decisive in every action they take in their lives. The Huojin philosophy is very similiar to the Horde's way of thinking; therefore, Huojin followers find themselves drawn to and eventually allied with the Horde. Tushui For the Tushui, meditation, training, and moral conviction outweigh quick action. The Tushui tend to think before acting, meditating upon all possibilities before making a decision that could be considered rash. Where a Huojin would simply make a snap decision that seemed the best at the time, the Tushui will think about the consequences and, if they are too dire, find an alternate solution that works best for all concerned. The way of the Tushui falls far more on the Alliance way of thinking and approach; therefore, Tushui followers find themselves drawn to and eventually allied with the Alliance. The Huojin and Tushui are not enemies. Both paths work to the same end -- living a venerable and honorable life. Huojin and Tushui don't look upon each other with derision. All pandaren on the Wandering Isle are respectful and friendly toward each other no matter which path they choose to follow. Though the Huojin can sometimes be rash, the Tushui admire their quick, on-the-fly thinking, and though the Tushui take their time, the Huojin admire their moral conviction and the strength of their beliefs. As a pandaren character, if you decide to play Alliance, your pandaren is one of the Tushui, and if you decide to play Horde, your pandaren is one of the Huojin. Keep that in mind when you're working through how your character would respond to certain situations. A Tushui would never make a rash decision without considering the consequences first, and a Huojin would never hesitate to make the first choice that springs to mind. The Wandering Isle and Pandaria proper have been separated from each other for thousands of years. They simply haven't seen each other at all. While a pandaren from the Wandering Isle would deem it fun and exciting to ally with either Alliance or Horde, a pandaren from Pandaria isn't interested in being anything but neutral to both sides. While the pandaren of Pandaria are quite happy to receive visitors and find the assorted races of the world interesting, they aren't interested in allying with one side over another. 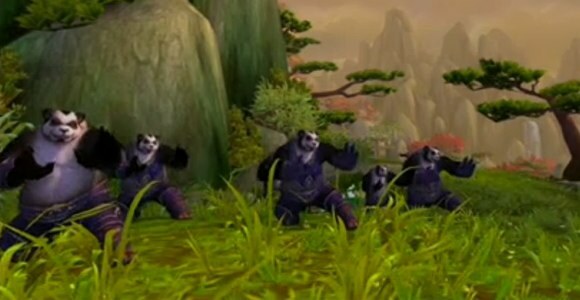 Instead, the pandaren of Pandaria emphasize a quiet kind of life of inner harmony and focus. We don't have any set-in-stone numbers to use for pandaren lifespans, but we can use the general lifespans set in the Warcraft RPG books as a guideline. Keep in mind however, these books are not official canon until stated otherwise. According to the books, a pandaren reaches adulthood at around 80 years of age, middle age at 175 years or so, old age at around 263, and venerable age at about 350 years. There is no maximum lifespan listed for the pandaren; however, they are not immortal. Liu Lang passed away many years ago. Even though an adult pandaren 80 years of age would be old enough to have lived through all three wars on Azeroth, they have no knowledge of these events. Whatever your pandaren happened to do while on the Wandering Isle is completely up to you -- the rest of Azeroth and its events are unknown to the pandaren, both on the Wandering Isle and on Pandaria itself. They've got no knowledge of any of the recent history of the world or the various races upon it. That said, a pandaren makes a particularly intriguing and fun choice for roleplay. The pandaren are a mystery to the rest of the world, and the world is a mystery to them. You're roleplaying what is essentially a blank slate. Nothing in Azeroth is going to be old hat to that character. None of the races they see are going to be races they've seen or interacted with before. The draenei and Outland will be a delightful and eye-opening trip for them to enjoy. The chaotic, shattered landscape of Azeroth will be a wholly new array of scenic vistas to explore. For a roleplayer, this leaves all kinds of opportunities open for interaction with other characters. The residents of Eastern Kingdoms and Kalimdor are a ripe target for endless questions, since their cultures, history and even appearance will be entirely foreign to your pandaren character. And for those roleplaying the existing races of Azeroth, seeing pandaren running around is sure to raise a few eyebrows as well. Far from a joke race, the pandaren have a rich culture and a storied history, whether you're looking at the pandaren of the Wandering Isle or those who inhabit Pandaria itself. If you choose to roleplay a pandaren, it's an opportunity to look at the world of Azeroth with new eyes and react accordingly.